I have the worst eyelashes. They are short and poker straight. With my Sally Hansen eyelash curler I would curl them before and after applying mascara and they would still fall flat, even with waterproof mascara. I had basically given up all hope of ever loving my lashes. 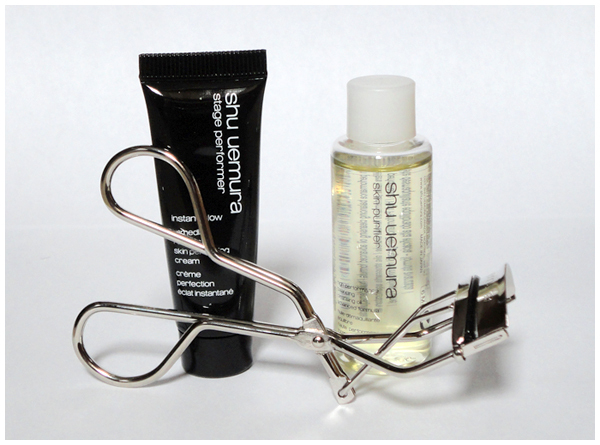 I had heard all of the hype surrounding the Shu Uemura eyelash curler but figured the price would make me cringe. I headed over to their website anyways to do some e-browsing, as you do. I found that their eyelash curler retails for $24 Canadian. Yes, this is steep for an eyelash curler, but it won't break the bank either. And if your eyelashes look like mine it just might be worth it. I ordered it early March when Shu Uemura's Canadian website had just launched. They were offering free shipping and that's what pushed to make the purchase. They also offer two decent-sized samples with every purchase. I chose the high performance balancing cleansing oil and the stage performer instant glow cream. I haven't really used the instant glow cream but I have almost finished the cleansing oil. This tiny sample lasted me quite a while (over two weeks) which is pretty awesome. It basically does the same thing as my MAC Cleanse-Off Oil so I don't know if I would purchase the full-size. It does what it is supposed to do but I don't think it's as life-changing as it's made out to be. The eyelash curler on the other hand may be magic. Just look at that before and after (and please ignore my crazy brows!)! Do you see those lashes? They go from looking stubby and non-existent to curled and fantastic! My eyes look so much more open and my eyelashes are fluttery. I never thought I would be able to describe my lashes as fluttery. This eyelash curler has granted all of my lash wishes. It's like an eyelash Genie. Am I going overboard with excitement? Quite possibly. If you can't tell, I am in love with this eyelash curler. Worth. Every. Cent. In just one five-to-ten second squeeze my eyelashes are curled and stay curled for the whole day. I don't even need to re-curl my lashes after applying mascara (which I know is horrible for them). The only thing different from this eyelash curler and others I have used is that the scissor-end doesn't open as far as most other eyelash curlers. I don't know if that is the secret to its awesomeness or not, but I thought it was worth noting. This eyelash curler may seem expensive but I think it's worth the investment. It will last me years and works 100 times better than any other eyelash curler I have ever used. If you have amazing eyelashes, then this won't be worth it for you. If you have always struggled with keeping your lashes curled, this is definitely worth a look. I'm Kayla. 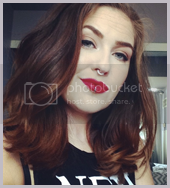 A 26 year-old beauty junkie, and cat lady, from Toronto, Canada. I love bright lips, bold colours and dewy skin. I blabber about beauty, lifestyle & fashion.